Bald cypress (also spelled baldcypress) is a conifer native to much of the United States. Bald cypress is one of the few conifers that is deciduous, dropping its leaves in the fall. It is well suited to extremely wet conditions and is often found growing naturally in swamps, bogs, streams and other areas of high moisture. It can also grow in drier areas and is commonly used in landscaping. Bald cypress can be found in USDA hardiness zones 5-10. The trunk grows unusually thick at the base, even when young. The tree is fast-growing and can add more than 2 feet of new growth per year. It can reach up to 50 feet in height in less than 25 years. 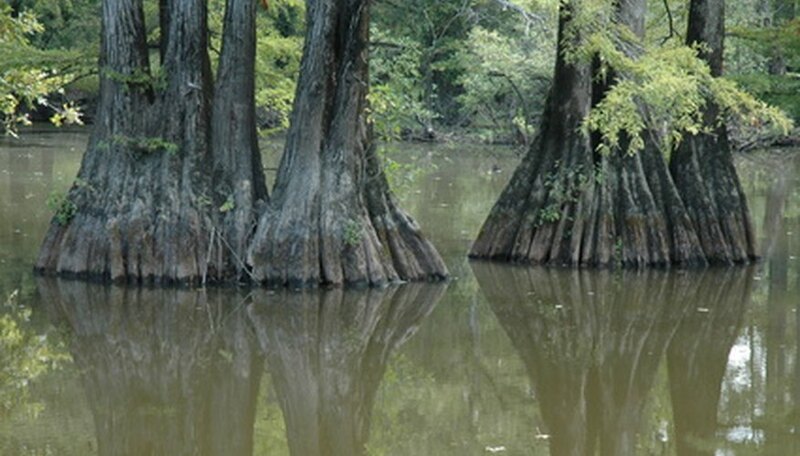 When growing in standing water, bald cypress will frequently send up large root projections, called "knees," around the base of the tree above the surface of the water. The leaves of the bald cypress are compound and feathery, made up of many small leaflets that are thin and lance-shaped. Each leaflet is less than two inches long, alternating along either side of a central stem. The leaf color is green during the growing season and turns to a yellowish-copper in the fall. The bark is brown, relatively thin and fibrous. The flowers are tiny and inconspicuous and fruit are small oval cones, one to three inches in length and between 1/2 inch and 1 inch in width. They are brown, dry, hard and made up of overlapping scales that conceal tiny seeds. Bald cypress can grow to 100 feet in height and can spread to 35 feet in width. The base of the tree is often wide and buttressed, leading to a narrow, tall leader trunk. The branches radiate from the central trunk and tend to droop. The crown of the tree is pyramid-shaped, symmetrical and upright. Bald cypress trees grow best in full sun and in a wide variety of soil conditions and are relatively drought tolerant. They can also withstand periods of extended flooding. Propagation is primarily from seeds. Once established, the tree is relatively free of maintenance requirements.